This easy 5-ingredient Sweet Potato Latkes recipe is a healthier take on the traditional deep fried potato pancakes. Such a tasty sweet potato recipe! 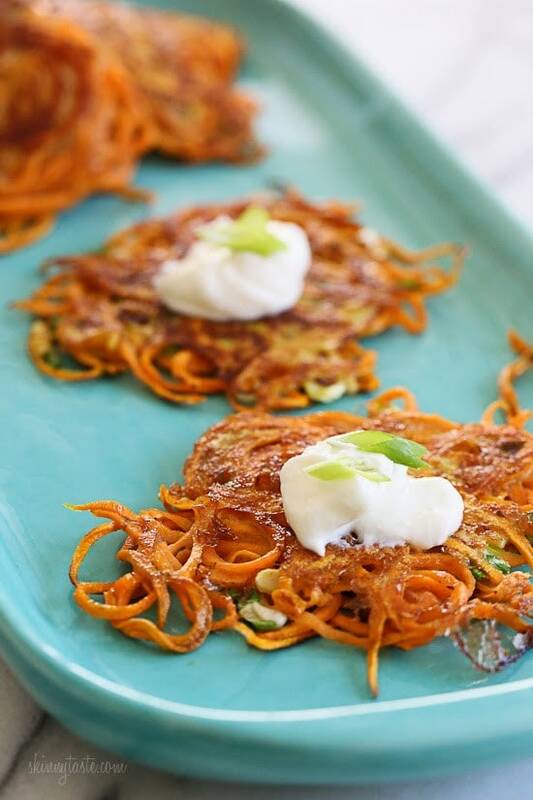 These latkes are lightly pan fried in a small amount of olive oil, made with sweet potatoes instead of white and made EASY by using a spiralizer because it eliminates the need to grate the potatoes, which can take a lot of time. 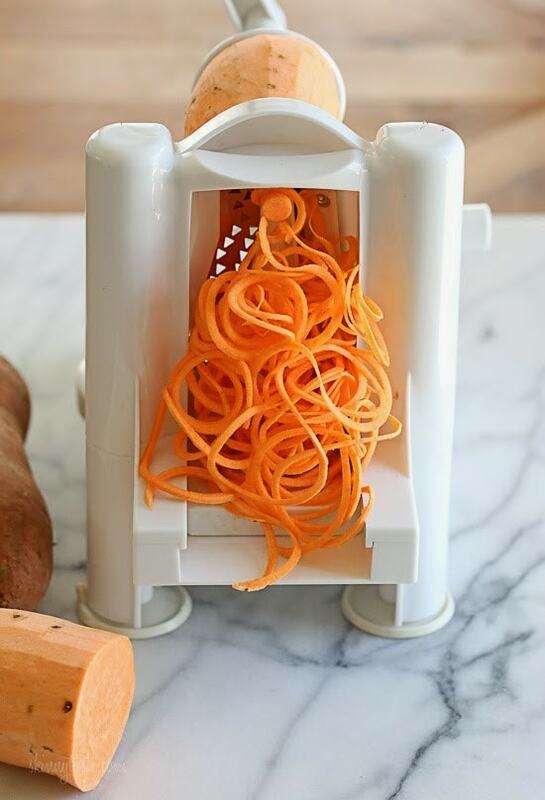 With the spiralizer, it only takes minutes. 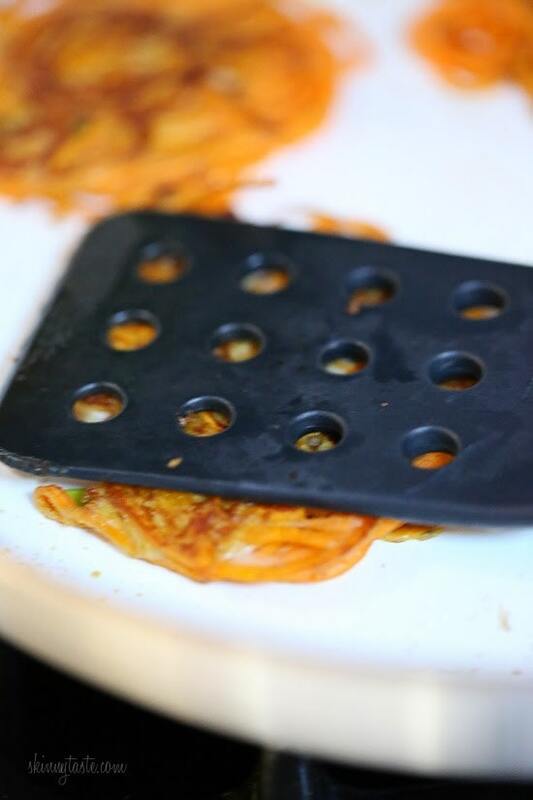 Of course, if you don’t have a spiralizer you can grate them with a box grater instead. The ingredients are simple: sweet potatoes, scallions, garlic and egg. I knew I wanted to lightly saute them in a pan with just a trace amount of oil and tried to see if they would hold without using flour and they worked out perfect, so they are kosher, gluten-free, whole30 and paleo-friendly. You’ll want to make them and eat them right away, they are best when they are hot. These go perfect with Braised Brisket – enjoy! 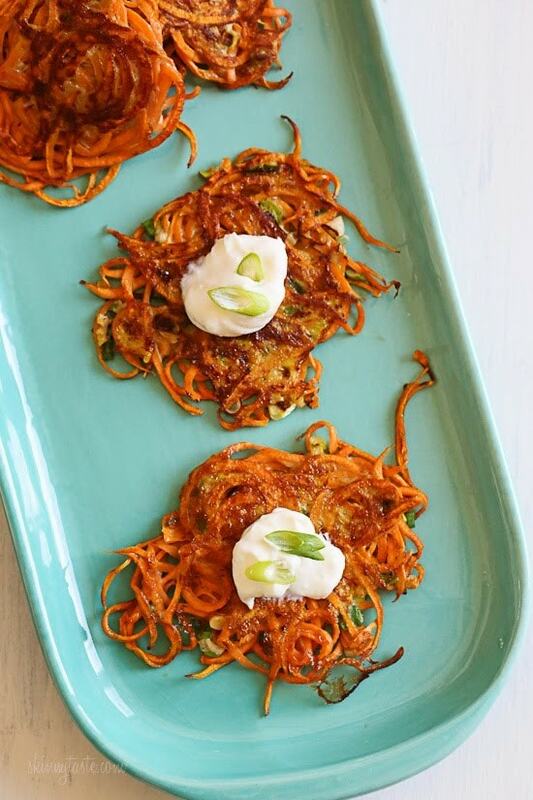 5-ingredient Sweet Potato Latkes – a healthier take on the traditional deep fried potato pancakes, these are lightly pan fried in a small amount of olive oil, made with sweet potatoes instead of white and made EASY by using a spiralizer because it eliminates the need to grate the potatoes, which can take a lot of time. 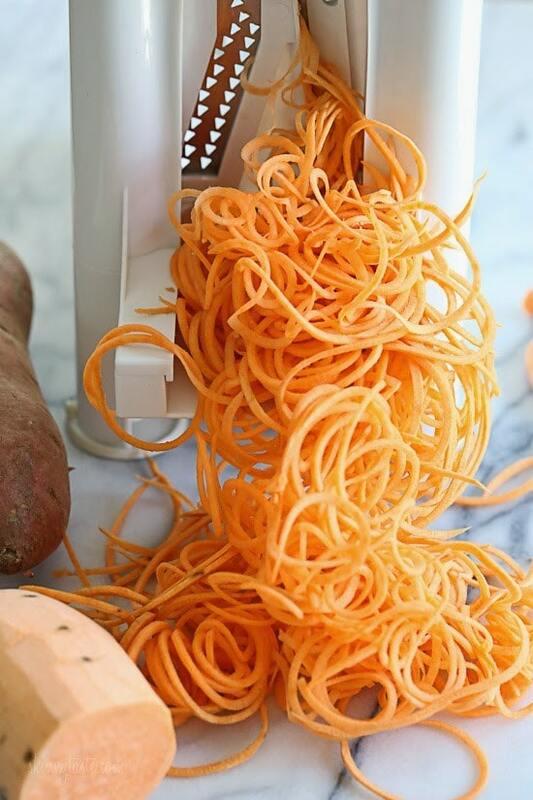 Cut the sweet potato in half so it fits easily into the spiralizer. Spiralize with the smaller noodle blade of the spiralizer. Cut into smaller pieces, about 5 inches long. 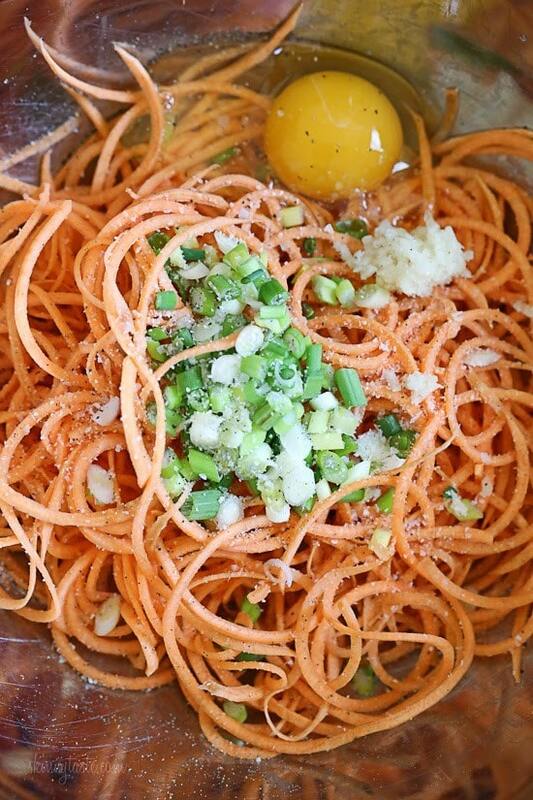 Mix together the sweet potatoes, scallions, eggs, garlic, salt and pepper in a large bowl and mix well to combine. Heat a large nonstick skillet over medium-low heat. When hot add 1 teaspoon of oil and swirl around the pan. Using a fork, grab some of the sweet potato mixture (roughly 1/3 cup), and gently place it in the skillet lightly pressing down with the fork. You can fit 4 on the skillet. Cook until golden on the bottom, about 3 minutes then flip with a spatula. Use the spatula to press them down to flatten and cook until golden, about 3 more minutes. Which spiralizer do you recommend? I made these as a side dish with dinner tonight. They were delicious!! I’ll be saving this recipe and making these over and over……. Can’t wait to try these for breakfast instead of hash browns. Can these be frozen? Will this recipe also work with butternut squash? If you do not have a spiralizer, what can you use instead? Being on whole30 has left me hating sweet potatos, until I got my Spiralizer!! 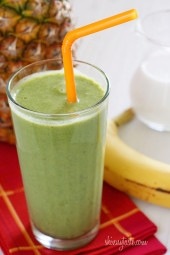 This is a great recipe, I’ve made them several days in a row!! I made these and they are stunningly delicious! Thank you for sharing the recipe. Delicious! Made these for dinner tonight and they were a hit. I will say it’s almost impossible to make 12 of them with this amount of ingredients….the spiralized potato is very difficult to separate into small portions. I ended up making five of them instead of 12. I served with a dollop of low-fat sour cream and they were delicious. Very simple yet tasty. Love that spiralizer! Has anyone tried grating the sweet potato? I don't have a spiralizer so i'm wondering if grating them will work? OMG I am in heaven. These were fabulous! Love the sweetness of the potato with a sprinkling of salt on top. 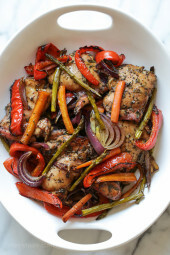 My new favorite recipe for Whole 30! We had pub night tonight at home. I made these with regular potatoes and a shredder. AMAZING!! Also served your Coconut Shrimp with it. Absolutely delicious meal. The whole family raved! Don't understand why the points are higher. But eill try. Must have had an old tater when I first tried it. I have a Paderno, too, so it's not the machine. I just made these for 1st night of Channukah, and it worked like a charm. I've had trouble spiralizing sweet potatoes. They're so hard that they don't go through as easily as zucchini. Is there something special I should do to prep them or when purchasing them? I have a Paderno which does it easily, the hand held ones might be harder to do. Nice idea, but I am thinking how grate potatoes will the hold together without using flour. I will definitely try this at home. What is the serving size? It says 4 but then says for 3 latkes. Recipe makes 12 latkes. Four servings of three. I did make these last night with just a couple of spice additions of cayenne and cumin. It was a bit difficult to spirilize the sweet potato but I got it done. The only thing I saw was that for some reason there was a lot of liquid in the bowl even though I mixed the ingredients really well. Almost too much egg. My sweet potato was 12oz. Before peeling. After browning one side which I did in coconut oil, I was able to flip them. Then I put them in the 400° oven on non stick aluminum foil. I was cooking my organic salmon at the same time. They came out slightly crispy and were very tasty. Will reheat the left overs for another meal. Do you have a recipe for apples using the Spiralizer and perhaps puff pastry? Go to Pinterest.com and search for "spiralizer recipes" and you'll find some apple ones…. I just received my Paderno Spirilzer from Amazon(on sale via Americas Test Cooking coupon). Plan on trying these tonight. Making Organic Scottish Salmon with it. Do these have to be made immediately after using the Spiralizer? If you read this please respond. Much thanks. Pinned it, made it, loved it! Don't skip topping them with sour cream & scallions, delish! The spiralizer u have……does it also act as a mandolin or is just a spiral slicer? What is the white cookware that you use here? 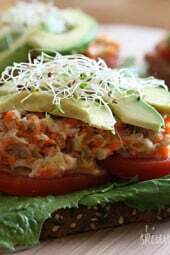 I love the looks of these recipes that use a Spiralizer but have been shopping for one and can't find one. Any suggestions as to where I can purchase one? I got mine on Amazon, it's the Paderno used above. Love it! The one Amazon sells is a Padermao knock off. Not the real thing. Lol! The one from Amazon is labelled and sold as Padermo so I guess it's a knock off of the Padermao. These are VERY yummy and my 11-month-old loved them as much as I did! While I followed the recipe precisely (and even let them cook a little longer than suggested to ensure they were nice and golden brown), they fell apart when I flipped them in the pan. Did anyone else have the same trouble? Any advice on how to get them to keep their shape? These look amazing and I cannot wait to try them! Also, did anyone order the new cookbook around the holidays and put in their purchase receipt to receive the other recipes and meal plan? I did it, and haven't received anything yet, and was getting concerned I might have missed an email or mailing. Any advice would be greatly appreciated! Thanks!! I also ordered the new cookbook around the holidays and never received the recipes and meal plan that I put in for. I thought it was just me. Can you suggest an egg substitute for these to hold them together? Much appreciated. I was thinking the same thing. I am going to try ground chia seeds. You ground them add some water and let it Gel.. its a substitude for eggs with just as much protien. Equal amounts of ground flaxseed meal and water also substitute for eggs as a binder…and add a good taste. Mix together and let sit briefly to "gel". I am making this with our ham on Sunday! 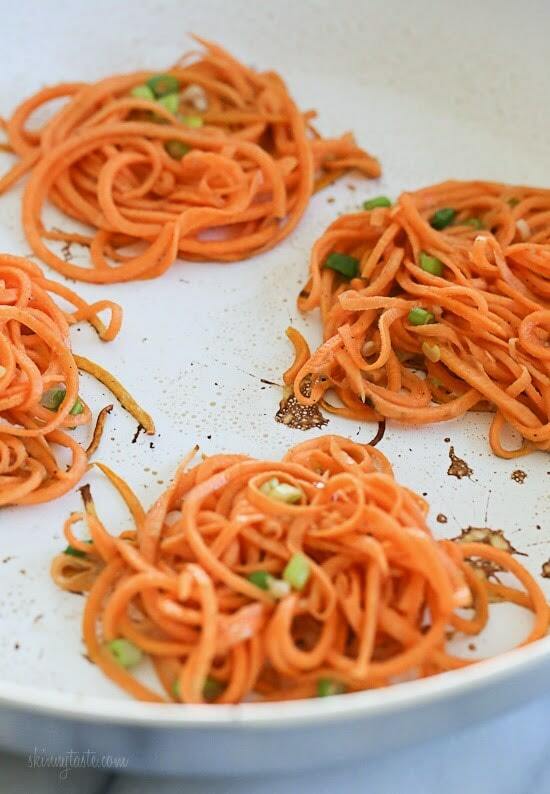 I just got a spiralizer and have been digging though your site for recipes! I cant wait to try this one! With what are they garnished? And perhaps sour cream or Greek yogurt. I don't see the egg on top mentioned. Are these poached? In the bottom picture, there is definitely an egg. That is a picture of the ingredients before mixing.